Happy New Year to all of my followers here on altrocklife! I trust you all had a relaxing holiday season. I’m sure I’m not alone when I say that as soon as the Buck’s Fizz hangover had worn off, I was ready to hit the shops and start spending my Christmas cheques. I was also lucky enough to be gifted a £50 New Look gift card, so that is where I spent most of my time during the sales. Here’s an outfit I put together from my new purchases. I love that you can see my metal flamingo peeking into the left of this photo. I’m obsessed with the pattern on this shirt. Why does this photo make me look like I’m wearing clown shoes? I promise I’m only a size 6, my feet aren’t that big. Shirt, £11: I think I’ll always be a sucker for collared shirts. I bought this shirt a size too big, because oversized shirts work well as a smart/casual choice: you can either wear it as-is for a more casual feel, or tuck it into trousers or a skirt to smarten it up. I also love the pattern: the bug design is simple but cute, and not too busy or overpowering. There’s a slight blue colour to the bug design, which means it’ll be nice to match with some blue earrings or a necklace. Plus, the shirt is a nice lightweight material which means it can be styled for all seasons. Jeans, £24.99: Admittedly, the jeans I purchased weren’t on sale, but they fit me so well, I had to splash out on them. I bought a black pair of these jeans about 18 months ago and they’re still going strong, so I knew that this pair would be a good investment. They’re very comfortable, and I know from experience that this cut suits me well and the jeans themselves are durable. Boots, £22.49: I’ve been after a nice pair of black boots with no heel for a while, and after buying a couple of cheap pairs from bargain outlets and being disappointed, I was very happy to come across these beauties. They’re extremely comfortable to wear, and the sole means that walking across mud or ice is a breeze. I like these boots because they have a similar look to Doc Martens, without the hefty price tag, and they haven’t taken me months to break in. What do you think of this outfit? What were your best holiday sale bargains? Let me know on my Facebook or Twitter page, or in the comment section below this post. On Tuesday, I had the great honour of graduating with the rest of my course mates and friends at the Bournemouth International Centre. It was a tiring but great day, and it was brilliant to walk across the stage, wave to my family, and receive my degree. To be honest, I didn’t have a massive budget to put together my graduation outfit, but in the end I was extremely happy with how I looked during the day. If you’re looking to graduate on a budget, hopefully this will give you some ideas. Check out the beautiful photography by my sister! So proud to have received my degree. My friend Lois was wearing the same dress as me, so you know it’s a good choice. I was pretty happy with the earrings I bought from Flying Tiger, considering I only purchased them the day before graduation! I did have a back-up pair in case I couldn’t pick up a gold pair, but I’m glad I managed to find these. I didn’t even realise that Flying Tiger sold earrings, so it was a nice surprise to pick them up. I was also extremely happy with my dress. I tried on four different dresses in New Look, and after a lot of deliberation the burgundy dress was the one I picked. You can’t see in the photos, but this dress has small cap sleeves, which I like because I get self conscious about the top of my arms. I also really like that the dress has a tie at the back, which helped to emphasise my waist…again, not particularly visible with the graduation gown over the top, but it still acted as a confidence booster. The boots were pretty comfortable to wear, considering I only took the label off of them on the morning of the ceremony! The heels were chunky which meant they were easy to walk in, and not too high so there was no risk of me falling over on the stage. They had gold detailing on the heel, which matched all of my jewellery and made them look and feel a bit more special. I hope my #OOTD has given some of you some inspiration! Did you find any bargain graduation buys this year? Let me know your thoughts on my Facebook or Twitter page, or in the comment section below this post. Hey altrocklifers! First of all I owe you an apology for not being able to post an update on Monday or last Thursday. I had a fair few technical difficulties, being limited to my phone and only able to access patchy WiFi at my resort in Spain. Fear no more, though, as I have returned, and on my birthday no less! The gold chain details on the top mean that I don’t have to accessorise with necklaces, which makes this outfit very no-fuss. Plus, the gold details on the sandals match up with the top, and help to lift and brighten the more autumnal colours of the top and shirt. This outfit is fairly casual, which makes it suitable for a meal out but a little too informal for a night out or drinks at a club. To dress this look up a little more, I’d swap the sandals for black wedge heels and the jeans for a skater skirt, with the top tucked in. What do you think of this outfit? Let me know on Facebook or Twitter. Hello altrocklifers! First of all I’d like to apologise for the slightly misleading post title: today’s outfit of the day is not the outfit I wore today (shock horror!). Instead it’s the outfit I wore out to my super early birthday bash last week, and it’s honestly my favourite outfit in my wardrobe right now. 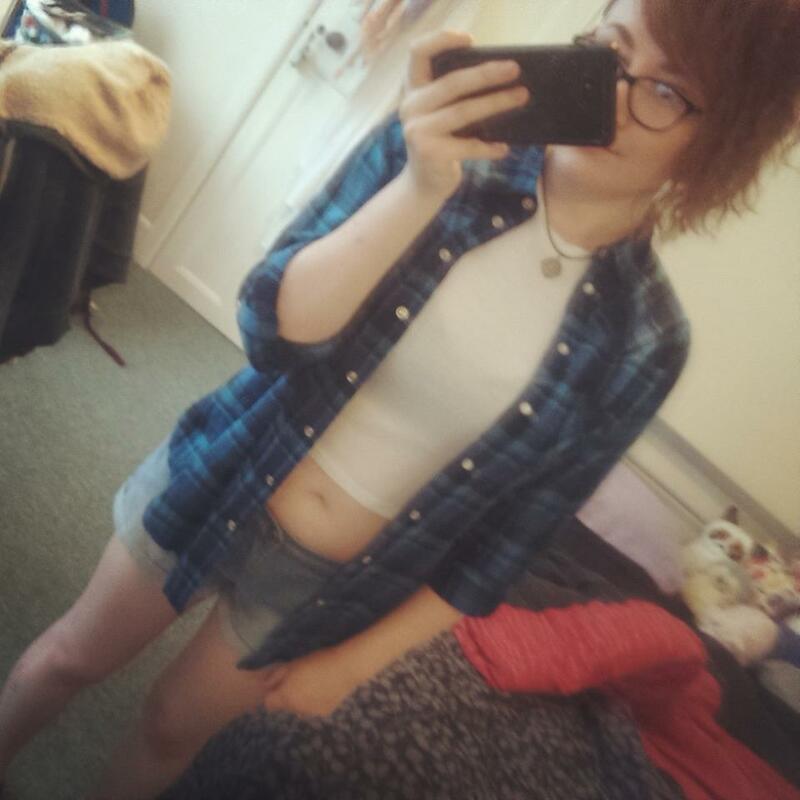 I’m so glad I bought these shorts, as they’re now one of my favourite items of clothing. Up until last week I struggled to find a top to match them with, but this outfit is a solid back-up. I wouldn’t normally wear so much black in summer, but I think the Drop Dead shorts are best suited to monochrome, and they were the feature of the outfit after all! The gold touches on the clutch, necklace and buttons of the shirt, as well as the glittery thread running through the shorts, helps to keep the outfit from blending into the background. What do you think of this outfit? How would you style these shorts? Let me know on Facebook or Twitter. Last week the weather was absolutely glorious, with the temperature reaching highs of 20 degrees here in beautiful Bournemouth. Unfortunately I was at university every day so unable to enjoy the beach, but that didn’t stop me dressing for the weather! Here are two of my favourite outfits from last week, that’s right, you get two outfits instead of just one! You can’t say I don’t treat my readers well. The forecast on the day I wore this outfit didn’t look as promising as the rest of the week, so I took my leather jacket with me as protection from the occasional chilly sea breeze. I did risk bare legs for the first time this year, though, and I think I got away with it! The pink detail around the hem of the playsuit and tortoiseshell sunglasses add a bit of colour to what otherwise would have been a pretty monochromatic outfit. I get paranoid wearing short flippy skirts without any leggings or tights underneath, so playsuits are a perfect compromise. Double denim is still my faithful friend, and this outfit is perfect for warmer days. The crop top and rolled up jeans add a couple of cheeky flashes of skin, while the long sleeves of the denim shirt help to protect my pasty arms from sunburn. The gold details of my belt buckle, necklace and sandals make the outfit look more premium than it actually is, considering half of the items were bought in Primark. What do you think of these outfits? Let me know in the comments or on Facebook or Twitter. Yesterday was the hottest day of the year so far in the UK! Unfortunately I was stuck in Lincolnshire, miles inland, while my friends sunned themselves on Bournemouth beach. That didn’t stop me channelling summer vibes when I chose my outfit though! Last week I wrote about my summer 2015 haul. A few days after I went into town, not expecting to spend any money, and left New Look with this beautiful dress. So consider this post an update to my summer wardrobe! I absolutely love combining light, feminine florals with darker, grungier pieces. The dress comes with some light padding in the chest, which is good because the back is a little too low which makes wearing a bra awkward. Bamboo sunglasses are super on-trend at the moment – combined with the tortoise-shell frames, my favourite sunnies are a winner. If I was off to the beach I’d add a black kimono and black strappy sandals. If I was wearing this outfit on a casual day out I’d add a cardigan and some boat shoes or lace-up trainers. This dress could also be worn on a night out, and I’d pair it with some wedge sandals and boho gold bangles. What do you think of this outfit? Let me know in the comments or on Facebook or Twitter. Yesterday I wore an outfit I thought was an excellent transition outfit from my winter wardrobe to spring fashion, if I do say so myself. At the moment here in Bournemouth, the bright sunshine can sometimes make the day seem warmer than it actually is. As soon as I leave the warm toasty confines of my bedroom, it becomes apparent that we’re still closer to winter than summer. This outfit turned out to be a good middle ground: I can stay cool in overheated lecture theaters, but I’ll still be protected from the chilly wind when I’m outside. I wore this outfit to university, but if the jeans were replaced with a smart skirt or tailored trousers it could easily become office wear. As Meryl Streep said in The Devil Wears Prada: “Florals? For spring? Groundbreaking.” A patterned shirt like this one adds a bit of fun to an outfit without reverting back to a default floral shirt. Plus, this coat will protect me from sudden showers and wind chill, but if the sun decides to show itself it can be worn open for a more casual feel. Tonight I’m hitting the town with my best friend and housemate to celebrate his 20th birthday. The club we’re going to plays a whole host of rock, metal, alternative and punk/punk-pop music. With that in mind, I decided to dress like an extra from a 90s pop-punk music video. If you squint at the crowd scenes next time you watch a punk-pop music video, I guarantee you’ll see at least three different girls wearing this outfit. Now I know this outfit is a little ambitious considering it’s only March, so if you’re not willing to brave the cold with bare legs then the shorts can easily be substituted for skinny jeans. Bonus points if they’re acid wash and have ripped knees. I also know that there will be plenty of my readers that don’t like wearing crop tops. They’re still a work in progress for me – it took about 20 attempts until I took a picture where I was happy with how my tummy looked. If you can’t stand the thought of wearing one, substitute it for a band t-shirt or a monochrome tee. Any colour of plaid shirt will work well here: I went for a vibrant blue this time, but to get the full 90s effect more muted, earthy colours will work wonders. When I head out I’ll be wearing my favourite black ankle boots, as pictured in my Christmas haul, and my faithful old leather jacket. What do you think about this outfit? What are some of your favourite 90s wardrobe essentials? Let me know in the comments or on Twitter or Facebook! Just a notice before I get started: altrocklife is now on Facebook! Make sure you head over and give the page a like here. Now then, back to business. This outfit of the day post is a little outdated, as I wore this outfit out to a friend’s birthday bash last Saturday. Hopefully it’ll give you some inspiration if you’re planning on hitting the town this weekend! I’d also like the make a disclaimer before we start. Even though the majority of my outfit was purchased in New Look, this post is not sponsored by them in any way. It wasn’t until I started writing this post that I realised just how New Look-centric this outfit is! I think skorts are perfect for nights out. They’re short enough to show off a bit of leg, but still keep you safe from sudden gusts of wind. Whilst that image of Marilyn Monroe is pretty iconic, it’s not something I want to replicate in the queue for a nightclub. The crop top adds a bit of fun to the outfit. I think I deserve bonus points as that was the first time I’ve EVER worn a crop top! Cue other fashion blogs clutching their chests and gasping in shock. I’m a bit insecure about my tummy, so the statement jacket on top helped me feel more comfortable. It also meant my midriff was a little less exposed. The flash of colour in the statement jacket makes what could have been a simple monochrome outfit a bit more fun. There’s nothing wrong with monochrome (I’m wearing all black today) but a little bit of colour can make a big difference. So there you have it! Do you like my outfit? How would you wear some of the pieces differently? Write a comment and let me know. Today I decided to wear autumnal tones of warm berries and fallen leaves, adding layers to help fight off the November chill. Jumpers combined with collared shirts are a personal favourite look of mine, and one I want to take right through the winter months and into spring. The embroidered owls add a cute and playful touch to the outfit, whilst the pleated skirt gives it a punk edge. The thick soles on my new winter boots are perfect for jumping puddles, but the outfit would also work nicely with my favourite Doc Martens. Finally, the outfit is completed by a warm berry lipstick, which adds colour to the dreary grey days. All that’s left to add is a leather jacket and thick wool scarf, and I’ll be prepared for any weather. Enter your email address to follow altrocklife and receive notifications of new posts by email.